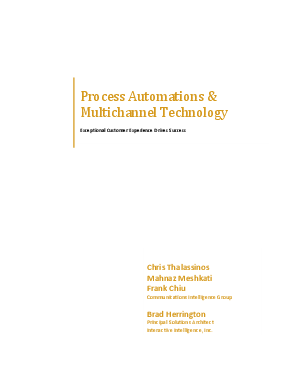 Today, business process automation isn’t just about efficiency, it’s about operating a business for your customers. To ensure a positive customer experience, a process must trigger an automated action, and automation must then manage the experience across multiple channels, personalize the customer’s interaction, and predict the best next actions. Read more, from Chris Thalassinos, Mahnaz Meshkati, and Frank Chiu of Communications Intelligence Group, and Brad Herrington of Interactive Intelligence.